Today I’d like to share with you one of the craziest things, but I love it! Let me be honest about one of my hang-ups: eye bags. Sometimes it looks like luggage, especially when I don’t get enough sleep. I dread the mornings; looking in the mirror and seeing those ugly, puffy eye bags. This is how you use it: Just don’t expect to see out of them because the lenses are so cold and frosty. Store your FREEZEFRAMES glasses and keep your gel pad attachments cold when you’re kicking back at home. Simply place the four little gel pad attachments into the pad pockets located inside top of their nice crush-proof travel case. Place travel case and gel pads int the freezer for at least 30 minutes. The travel case is really cool because it contains s thermal layer that will keep your gel pad attachments cool for later use. Not only dues it reduce eye puffiness, FREEZEFRAMES is also great for other uses,. Have a nasty migraine? It’s perfect for that; cooling down your eyes and helping you feel less stressed. Let’s not forget it also is constructed with headache trigger points all around your eyes and temples! Very cool. In addition, It’s a good relief on hot days, helping to hit your “reset button.” Another aspect is that FREEZEFRAMES is great for decreasing swelling related to injury or plastic surgery. The coolness of it increases healing to injured and treated areas on your face. And it’s perfect if you are hungover! What a nice way to begin your morning after; with some soothing ice cold glasses! 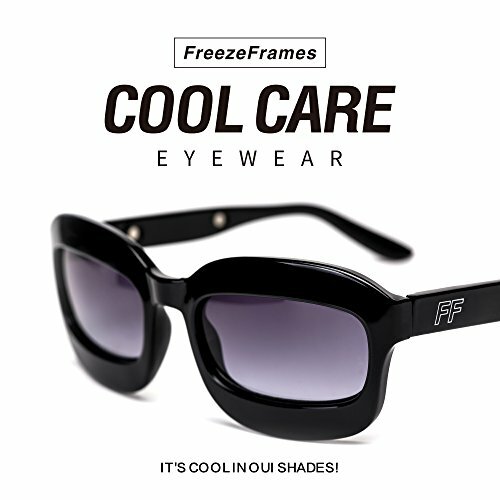 FREEZEFRAMES sunglasses merge fashion and function, using convenient cool-pad attachments for easy, discreet cool therapy. Aren’t beauty gadgets fun? You’ve got to try this! Experience the coolness for yourself. For further details please visit www.freezeframes.com.